Every seat is fitted with a head restraint. The front head restraints are intended solely for use with the front seats, and the centre rear head restraint is intended solely for use with the central seat in the rear bench seat. For this reason, do not install head restraints in any other position. Lower the head restraint as required . 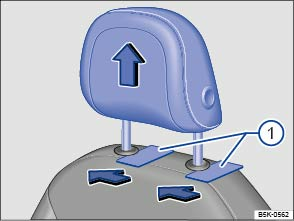 To release the head restraint, slide a flat object such as a plastic card between the backrest cover and the caps on the head restraint guide pins while a second person pulls the head restraint out fully. 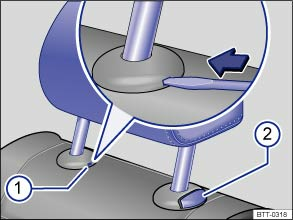 Position the head restraint correctly over the head restraint guides and then insert into the guides of the corresponding seat backrest. Slide the head restraint all the way down until the guide pins click into place. Adjust the head restraint so that a correct sitting position can be assumed . Release the rear seat backrest and fold the backrest forwards slightly . Insert the unfolded vehicle key bit or the flat edge of the screwdriver from the vehicle toolkit into the slot in the cap . Press and hold the vehicle key or the screwdriver in the direction of the arrow. At the same time press button ② while a second person pulls the head restraint out fully. Push back the rear seat backrest and allow it to engage securely. Press and hold the button and push the head restraint downwards. Head restraints that have been removed should be reinstalled as soon as possible to ensure that passengers are properly protected. When removing or fitting head restraints, ensure that they do not hit the headliner or other parts of the vehicle. The headliner and other parts of the vehicle could be damaged.